Palo Santo is derived from the bursera graveolens tree located in the rain forests of South America. Translated it means holy wood and is associated with spiritual growth, protection, purification, grounding, and healing, as well as creativity, good fortune, attracting positive energy, and ancient wisdom. 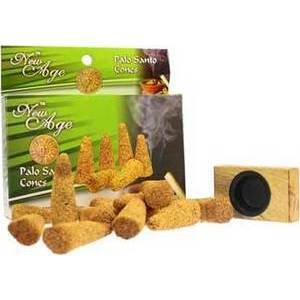 This is a 12 pack of New Age Incense cones that are 1 and 1/2 inches by 5/8 of an inch. These larger than average cones are accompanied by a holder of proper proportions for burning.